Sneaking a bite of cookie dough is arguable the best perk of committing to get in the kitchen and bake, but as we’ve been warned over the years, it’s not exactly safe. Between the raw eggs and raw flour in the dough, you’re taking a gamble every time you eat that sweet uncooked dough. Thankfully, a number of safe snackable cookie doughs have cropped up in grocery stores and beyond in recent years, and Ben & Jerry’s is about to saturate the market even more. The popular Vermont-based ice cream company just introduced three varieties of edible cookie dough bites to safely satisfy your cookie dough needs. 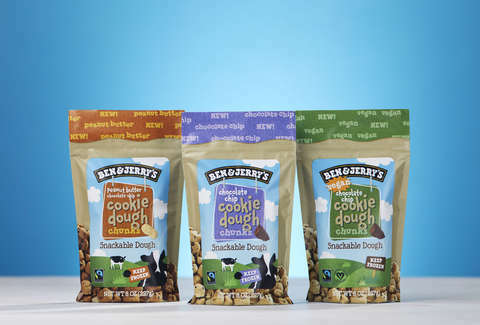 Ben & Jerry’s new range includes Chocolate Chip Cookie Dough Bites, Peanut Butter Chocolate Chip Cookie Dough Bites, and, for the lactose intolerant, Non-Dairy Chocolate Chip Cookie Dough Bites. The doughy bits look similar to those found in Ben & Jerry’s cookie dough-laden ice cream pints, but without all the extra stuff. The cookie dough bites were first introduced in Vermont last year in half-pound bags of the chocolate chip and peanut butter varieties. Each bag contained eight servings of the delicious dough balls. Perhaps unsurprisingly, they were well-received. 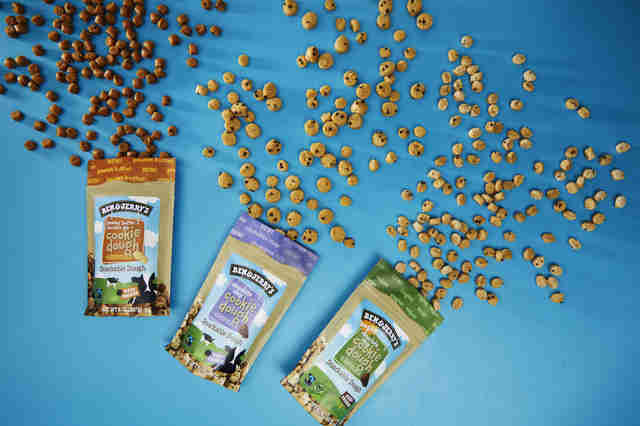 They were such a hit, in fact, that Ben & Jerry’s decided it was time to roll them out nationwide, meaning you’ll be able to pop into your grocery store and grab a bag to stress-eat whenever a craving hits. They’re safe to eat because they contain pasteurized eggs and heat-treated flour. Take that, CDC warnings. Ben & Jerry’s didn’t say anything about the cookie dough bites being a limited time offer, so there’s no need to rush to the store to buy them. We should note, however, that these are likely to be popular, so you may want to grab a bag or two sooner rather than later.